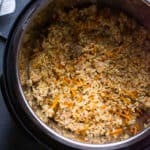 Healthy Instant Pot Chicken and Rice Recipe with boneless chicken breast or thighs and brown rice cooked in one pot of electric pressure cooker. Comes out perfect every time! On Instant Pot, press Sauté and let appliance preheat a few minutes until display says Hot. Add olive oil, onion and garlic; sauté for 3-4 minutes, stirring occasionally. Press Cancel and add thyme, oregano and cumin; cook another 30 seconds, stirring constantly. Add remaining ingredients in the following order: chicken, carrots, brown rice, water, salt, pepper and bay leaves. Do not stir. Close the lid, set pressure vent to Sealing and press Pressure Cooking on High for 22 minutes. Display will say ON, Instant Pot will take about 15-20 minutes to come to pressure, you will see a bit of steam coming out from a valve, then float valve will rise and countdown will begin. When display says OFF, release the pressure using Quick Release method by turning pressure valve to Venting position, which takes 2-3 minutes. I recommend doing so outside to avoid smell and mess in the house. Then open the lid. Stir. If you like corn and peas with your chicken and rice add frozen now and stir again. Serve hot! *If using chicken thighs, add a bit less water ( 3 2/3 cups total) because thighs are fattier and add to the liquid content during cooking.